Unlike our familiar planet Jupiter, so-called hot Jupiters circle astonishingly close to their host star — so close that it typically takes fewer than three days to complete an orbit. And one hemisphere of these planets always faces its host star, while the other faces permanently out into the dark. In the mysterious case of exoplanet CoRoT-2b, however, the hot spot turns out to lie in the opposite direction: west of center. A research team led by astronomers at McGill University’s McGill Space Institute (MSI) and the Institute for research on exoplanets (iREx), all members of the Center for Research in Astrophysics of Quebec (CRAQ) in Montreal, made the discovery using NASA’s Spitzer Space Telescope. Their findings are reported Jan. 22 in the journal Nature Astronomy. 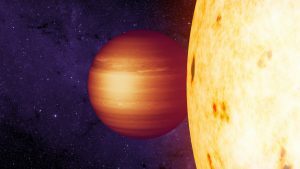 “Both of these factors suggest there is something unusual happening in the atmosphere of this hot Jupiter,” says Lisa Dang, a McGill PhD student and lead author of the new study. By using Spitzer’s Infrared Array Camera to observe the planet while it completed an orbit around its host star, the researchers were able to map the planet’s surface brightness for the first time, revealing the westward hot spot.